Full text of the study, "The effect of medical marijuana on health and labor supply," appears in The Journal of Policy Analysis and Management. Spokane, WA: The enactment of adult use marijuana sales in Washington state is not associated with upticks in self-reported marijuana use by most teens, according to data published in The Journal of Adolescent Health. A team of investigators from Washington State University, the University of Massachusetts, and the Colorado School of Public Health assessed trends in teen marijuana use and employment in the years immediately prior to and immediately following the enactment of retail marijuana sales (2010 to 2016). They reported that "marijuana use decreased significantly among working and non-working 8th and 10th graders." Marijuana use similarly declined among 12th graders who were not employed. Among 12th graders who were employed more than eleven hours per week, self-reported cannabis use increased over the study period. The study's authors acknowledged that this latter finding was not unexpected because "the workplace may expose adolescents to peer or adult coworkers' potentially unhealthy behaviors, including substance use." Authors further acknowledged that working youth were also more likely to have reported using cannabis prior to the passage of legalization. Numerous prior studies have reported that changes in the legal status of cannabis are not associated with increased marijuana use or access by young people. Full text of the study, "Employment and marijuana use among Washington state adolescents before and after legalization of retail marijuana," appears in The Journal of Adolescent Health. Additional information is available from the NORML fact-sheet, "Marijuana Regulations and Teen Use Rates." Austin, TX: An amendment authored by the Texas Department of State Health Services removes industrial hemp and certain hemp-derived cannabinoids from the state's controlled substances act. The order takes effect on April 5. The order states that under Texas law, "The term marihuana does not include hemp," as defined under the provisions of the 2018 Farm Act. The language also exempts certain compounds extracted from industrial hemp from the state list of controlled substances. In December, the President signed legislation into law amending the federal Controlled Substances Act of 1970 so that hemp plants containing no more than 0.3 percent THC are no longer classified as a schedule I controlled substance under federal law. The Act also broadens the definition of ‘hemp' (Section 297A) to include "any part of the plant, including ... extracts [or] cannabinoids" that do not possess greater than 0.3 percent THC on a dry weight basis. The new order comports Texas' statutes with the federal law. Speaking to Congress in March, Agriculture Secretary Sonny Perdue said that the Department is working to create federal hemp regulations by 2020. Under the provisions of the 2018 Farm Bill, US states that wish to license commercial hemp cultivation must submit their plan to the USDA. Currently, there are no specific Texas statutes establishing regulations for the commercial production of industrial hemp. The state does regulate the production and dispensing of CBD, but only through a narrow medical program. Trenton, NJ: Legislative leaders on Monday postponed scheduled floor votes on legislation that sought to legalize and regulate the adult use marijuana market. The delay was announced after it became unclear whether the measure possessed enough votes to pass on the Senate floor. Despite the delay, Democratic Gov. Phil Murphy continues to back the plan, as does Senate President Stephen Sweeney. "The fight is not over," Sen. Sweeney said. "Anybody who thinks this is dead is wrong. This is not an issue that's going away. Marijuana will get passed in the state of New Jersey one way or another." Commenting on the delay, NORML Political Associate Tyler McFadden said: "Voters and lawmakers both agree that the practice of treating marijuana consumers as second-class citizens must end. Unfortunately, legislative intransigence regarding how best to create a regulatory framework has resulted in, at least for now, a continuation of the failed policy of marijuana criminalization in the Garden State." She added: "Criminalization is a policy that results in over 35,000 marijuana-related arrests annually in New Jersey -- mostly for low-level marijuana possession. These arrests do not promote public safety, cost taxpayers millions of dollars, and disproportionately impact the poor and communities of color. It is pivotal that leadership address and enact needed marijuana law reforms in New Jersey, including efforts to expunge past low-level marijuana convictions." Washington, DC: The outgoing commissioner of the US Food and Drug Administration, Scott Gottlieb, has reaffirmed his stance that it could take several years for the agency to create regulations specific to the marketing of certain CBD-infused products. Gottleib insisted that regulating CBD requires a "highly novel rulemaking process" that could take years to finalize. He further suggested that this process could be expedited if Congress enacted explicit legislation addressing the issue. His statements echo comments he made earlier this month when he cautioned it could take up to four years for the FDA to create a regulatory pathway for the retail sale of CBD-infused food products or health food supplements. Gottleib advised that the agency is putting together a working group to study the issue, and that it could have initial recommendations by as early as this summer. In December, Congress enacted legislation removing industrial hemp (defined as cannabis containing less than 0.3 percent THC) and products containing cannabinoids derived from hemp from the federal Controlled Substances Act. However, the following day, the FDA stated, "[I]t's unlawful under the FD&C Act (US Food Drugs and Cosmetics Act) to introduce food containing added CBD or THC into interstate commerce, or to market CBD or THC products as, or in, dietary supplements, regardless of whether the substances are hemp-derived." That announcement led to regulatory agencies in several states pulling certain CBD-infused products from the retail market. Investigators from UCLA, Stanford University, and San Francisco State University assessed the use of dronabinol in five cancer patients who also suffered from persistent night sweats. Two subjects reported "complete resolution of night sweats" following cannabinoid therapy, while the other three patients reported "a decrease in the severity of their night sweats." They concluded: "Once the patients experienced resolution of their night sweats, other symptoms such as anxiety and fatigue improved as well, which lead to an improvement of their overall quality of life. Symptoms resolved in less than one week of initiating the dronabinol [treatment] for all five patients. ... Future research could benefit from a double-blinded randomized trial of dronabinol versus placebo treatment for the management of night sweats in patients with oncologic disease." 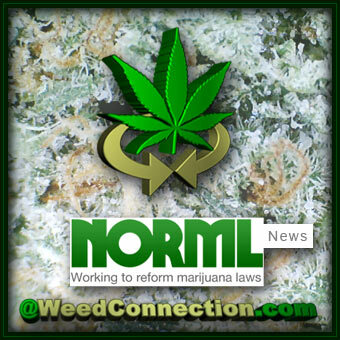 For more information, contact Paul Armentano, NORML Deputy Director, at: paul@norml.org. Full text of the study, "Dronabinol for the treatment of paraneoplastic night sweats in cancer patients: A report of five cases," appears in the Journal of Palliative Medicine.